It’s time for a little mudslinging in Lancaster County. The last weekend in February marks the start of Lancaster County mud sales, a welcome reminder that the ground is thawing and spring is on its way. Local fire departments will auction off some of the area’s best consignments at sales throughout the county, which are growing in popularity, attracting thousands of people each season. Auctioneers’ voices echo out numbers for wares such as antiques, popular handmade Amish quilts, farm equipment, livestock and more. Handmade Amish quilts are a popular auction item at Lancaster's mud sales. Boys help transport goods to visitor's vehicles. Another big attraction is Lancaster’s finest homemade fare served fresh at auctions. Local volunteers bake and cook some of the county’s favorite staples, including whoopie pies, chicken corn soup, sticky buns, funnel cakes, and pulled pork, just to mention a few. Mud sales in Lancaster County are not only becoming a popular destination, they also serve as a benefit to the local fire companies as one of their biggest fundraisers of the year. The allure of a Lancaster mud sale is the atmosphere, the food, the benefits it serves the community and Lancaster County’s Amish culture. Oh ... and the food. 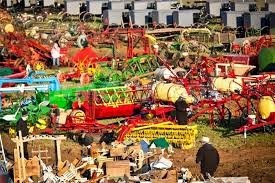 Farm equipment is just one of the many items up for bid at auctions. The auctions are held on the grounds of local fire halls and are a gathering of bidders, buyers and spectators. Residents, the Amish community and travelers visit from near and far to scope out items. For those who are craving some good-old Lancaster county food, it certainly is plentiful at each sale. And if you find you’re too stuffed to carry your treasures to the car, young Amish boys are more than happy to transport your goods for a small monetary donation. The mud sale season kicks off this weekend with the Strasburg Spring Consignment and Mud Sale, located at the Strasburg Fire Company, 46 West Main Street in Strasburg, Pennsylvania. All sales start at about 8 a.m. and continue throughout the day. Dress accordingly, show up with a hefty appetite and enjoy one of Lancaster County’s most unique and beneficial events. Sales are held through August. Lancaster County offers over 30 bed and breakfast establishments to fit your needs as well. Check out www.authenticbandb.com for a place to hang your hat for the night. And don’t worry about the muddy boots, we’re used to it. Visit Lancaster and experience a growing tradition, get muddy, buy a tractor, or a calf or just enjoy the atmosphere with a funnel cake. Hope to see you this season. For a complete list of mud sales, visit www.discoverlancaster.com.